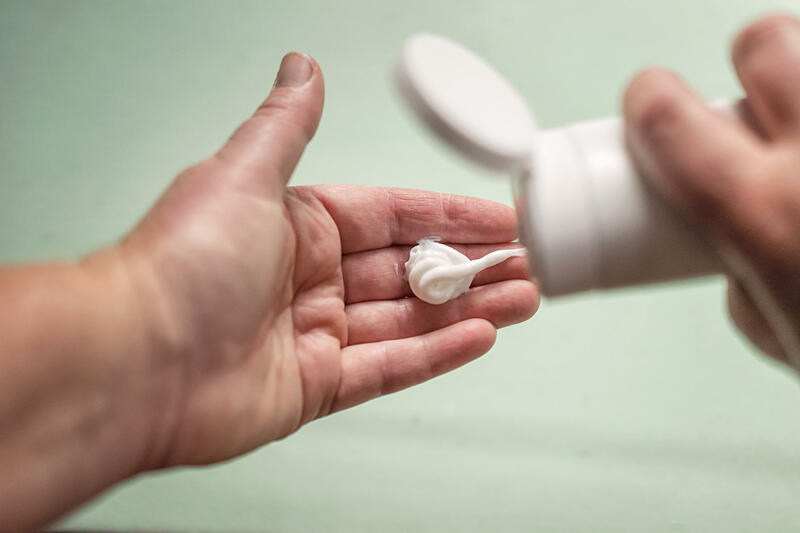 A recent test by dermatologists found that 83 percent of the top-selling moisturizers that are labeled "hypoallergenic"contained a potentially allergenic chemical. "My ankles and calves are all scratched up as we speak — and my hands," she says. For people like Walter, moisturizers aren't just for smoothing skin. They can actually treat the dry, cracked and reddened skin that come with conditions like eczema. But finding the right moisturizer can be truly "hit or miss," she says. "Because you can't just go to a drugstore and open up all their tubes of cream to make sure they don't aggravate your skin." So Walter ends up throwing a lot of products away. "Basically, it's a big expense," she says. "Every single day, I get questions about what moisturizer should I use, what sunscreen should I use," says Dr. Steve Xu, a dermatologist at Northwestern's Feinberg School of Medicine. "I found myself really struggling to provide evidence-based recommendations for my patients," he says. So he decided to take on the challenge of figuring out "what's actually in this stuff." Xu and some of his colleagues at Northwestern examined the ingredients of the top 100 best-selling moisturizers sold by Amazon, Target and Walmart. What he found was pretty surprising, he says. Nearly half — 45 percent — of the products in the study that claimed to be "fragrance-free" actually contained some form of fragrance. And the vast majority — 83 percent — of products labeled "hypoallergenic" contained a potentially allergenic chemical. Bottom line: The vast majority of moisturizers that are best-sellers "have some form of potential skin allergen," Xu says. And when a product is labeled "dermatologist-recommended," Xu says, "it doesn't mean much," because there's no way of knowing how many dermatologists are recommending it, or who they are. "It could be three dermatologists, or a thousand," he says. In large part, the deceptive labels result from the lack of federal regulation of these sorts of products. The Food and Drug Administration considers moisturizers cosmetic and barely regulates them. There are some labeling requirements, but they can be easily avoided by companies that claim the ingredients are "trade secrets," says Dr. Robert Califf, vice chancellor for Health Data Science at Duke University School of Medicine and a former FDA commissioner. "The cosmetics industry is highly competitive," Califf says, "and if someone can easily copy someone else's successful cosmetic, that would be a competitive disadvantage." And when it comes to adverse reactions, manufacturers aren't required to report consumer complaints about cosmetics. This means the FDA doesn't know the extent of the problem, says Califf. "I don't think it's too much to ask of manufacturers that they [be required to] register what they're selling so that it can be tracked," he says. Califf wrote an editorial accompanying Xu's study; both were published in a recent issue of JAMA Dermatology. Congress is now considering legislation that could make the industry more accountable. In the meantime, dermatologist Xu recommends what he calls a "skinny, skin-diet." "What we mean is, using the least amount of products with the least amount of potentially allergenic materials or chemicals in them," he says, "to reduce the risk." Xu says some single-ingredient products — like petroleum jelly, shea butter, sunflower oil or cocoa butter — can minimize the risk of an allergic skin reaction. We have news for anybody who uses a skin moisturizer. Many brands claim that their products are fragrance-free or hypoallergenic. NPR's Patti Neighmond reports on a new study that found most of those claims to be false. PATTI NEIGHMOND, BYLINE: For most of us buying a fragrance-free moisturizer that turns out not to be fragrance-free might be frustrating but not harmful. That's not the case for people with skin conditions, like Kathryn Walter, who has severe eczema. KATHRYN WALTER: I'll use a moisturizer that says there are no fragrances, there are no additives, no dyes and lanolin and any kind of masking fragrance. NEIGHMOND: And when that turns out not to be the case, she often feels it immediately. WALTER: I will start to itch, and I have to get it off my body right away. NEIGHMOND: For people like Walter, moisturizers aren't just for smoothing skin. They can actually treat the dry, cracked and reddened rash of skin disorders. But more often than not, Walter ends up with a product that does the opposite. WALTER: My ankles and calves are all scratched up as we speak, and my hands. STEVE XU: Every single day, I get questions about what moisturizer should I use, what sunscreen should I use? NEIGHMOND: Steve Xu is a dermatologist at Northwestern University who sees lots of patients like Walter. XU: And I found myself really struggling to provide evidence-based recommendations for my patients. XU: The vast majority of moisturizers that are best-sellers that are popular have some form of potential skin allergen. NEIGHMOND: In large part, deceptive labels result from the lack of federal regulation. The FDA considers moisturizers cosmetic and barely regulates them. There are some labeling requirements, but Duke University professor of medicine Rob Califf says they are easily avoided by company claims that ingredients are trade secrets. ROB CALIFF: Well, the cosmetics industry is highly competitive, and if someone could easily copy someone else's successful cosmetic, that would be a competitive disadvantage. NEIGHMOND: And manufacturers aren't required to report consumer complaints. Califf, a former commissioner of the FDA, says this means the agency doesn't know the extent of the problem. CALIFF: I don't think it's too much to ask of manufacturers that they register what they're selling so that it can be tracked. NEIGHMOND: Congress is considering legislation that could make the industry more accountable. In the meantime, dermatologist Xu recommends a skinny skin diet. XU: What we mean is using the least amount of products with the least amount of potentially allergenic materials or chemicals in them to reduce the risk. XU: The shea butters and the food oils like sunflower oil, cocoa butter. NEIGHMOND: ...Pure and simple products that can minimize the risk of a harmful skin reaction. Patti Neighmond, NPR News. Transcript provided by NPR, Copyright NPR.